ZEUS is the body sensor. It is a glue-on skin patch and energy source for the electronics module at the same time. 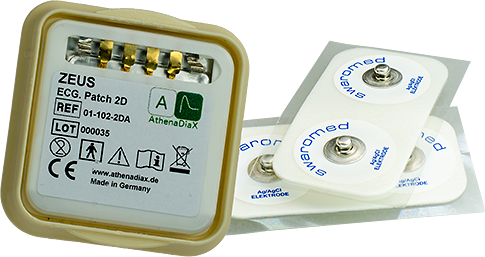 The module remains on the patient's chest up to 7 days by using interchangeable snap-on ECG pads. ZEUS has been designed for optimal long term recording. Its shape adapts to the body contour in an optimal manner. both with separate snap-on ECG pads.